No matter what’s ailing your computer, Mark Wilcox Computer Services, Inc. is ready to help set it right again! From virus removal, to general repairs and maintenance, to upgrades, updates and anything else it might need, count on a professional to keep your machine running right. With decades of experience and extensive credentials, you can trust Mark with your computer. Mark explains everything to you in plain English, so you always know what’s going on with your computer and what our approach to delivering service is. Rely on our experience and attention to detail to make sure your computer is being handled expertly and carefully. Mark has experience with both PC and Mac computers and offers a complete range of hardware and software services for both. Need emergency repairs right away? Emergency same-day service available! Just give me a call at 218-290-1339. My credentials include Comp TIA A+ certification, Microsoft Certified Professional Systems Engineer and Certified Novell Engineer. For the average computer user, trying to keep up with computer maintenance, repairs, upgrades and other issues can be overwhelming. When something goes wrong with your computer or you need help navigating hardware or software issues, don’t worry about trying to make sense of things yourself. Instead, give Mark Wilcox Computer Services, Inc. a call! I’m dedicated to providing you with total computer repair in St. Louis County, MN. From virus and malware removal, to hardware and software upgrades, to operating system updates, program installation, network configuration and just about anything else, I’m your tried and true computer experts. 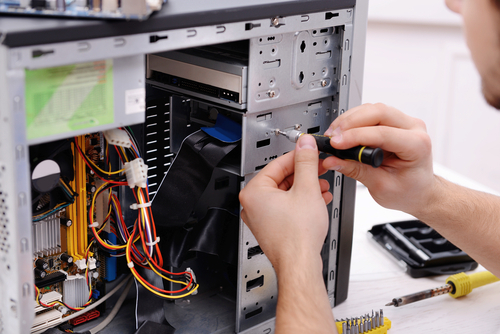 When it comes to computer maintenance in St. Louis County, MN, my mission is to help you get the most out of your machine at all times. My tune-up services encompass all of the necessary maintenance to restore fast speeds and reliable function to your computer, while our configuration and updating services make sure you’re running the most recent, reliable versions of software. Or, if you’re looking for a totally custom solution, call on me to build your PC to unique specs, just for you! We’ll make sure it has all of the high-quality hardware you need, within a price point that’s reasonable. And, when it comes to getting everything set up just the way you like it, call on me for home or office setup. From your network to any connected devices, we get everything up and running right! Don’t let a buggy PC or problematic piece of software and/or hardware make your computing experience frustrating. Contact me for prompt, professional service and noticeable results for your computer.